Well it sure warmed up here in central NC thank goodness! Hope wherever you are you are at least warm somehow. 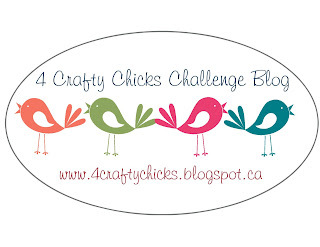 It's time for a new challenge at 4 Crafty Chicks. 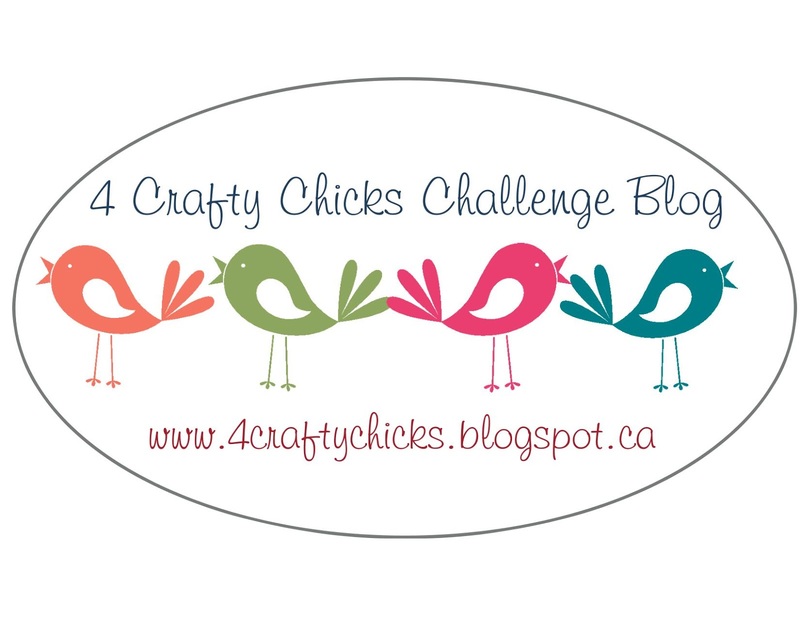 I'm hostess this week and I want to see NO BLUE color! Blue is a cool color, represents coolness/cold. Since so many of us have been either freezing and snowbound or just freezing, I thought it would be good to create using any color/colors but blue. Stamps: Hearts with words (Recollections). Paper: White Neenah cardstock; black stripe patterned vellum (Die Cuts with a View); black cardstock (Bazzill). Ink: It's a Girl, Mint To Be, Sweet Sixteen, Tiara (Catherine Pooler Inks). Extras: Postage stamp die (Simon Says); XOXO die (Stamplorations); arrow die (Taylored Expressions); Love word die (Ellen Hutson) small heart die (Paper Sweeties). With Valentines Day around the corner, I decided to make a valentine card free of blue. I found a bag of candy word hearts in my pantry left over from last Valentine's Day and it inspired me to use an old stamp set I've rarely used of these hearts with love phrases. I stuck to just three different large hearts (there are about six in all) and the smaller ones. I have to admit when I made the background I was at a loss for what else to do with the card until I saw the striped vellum on my desk and the black "love" word leftover from Christmas cards. The rest is history as they say. Stop by the Hen House and check out the rest of the Team's projects. Then come play along with us! 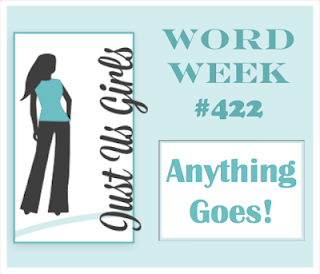 And remember, it's now Anything Goes all the time with a weekly twist challenge with this week's twist challenge being NO BLUE. 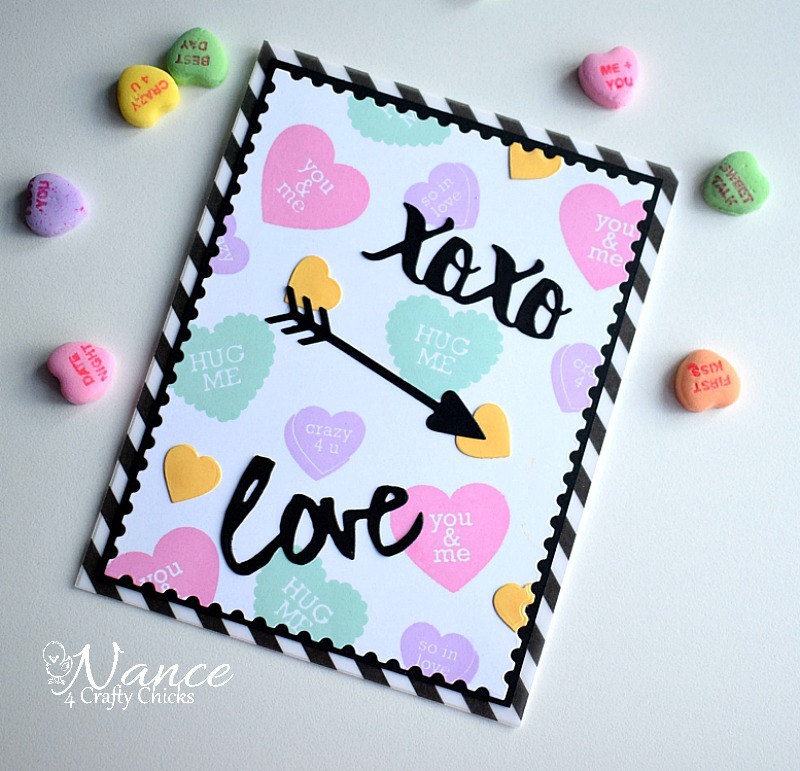 Love these heart stamps and the pastel colors, Nance! Valentine's Day is right around the corner! Such a sweet card...love all those wonderful hearts!